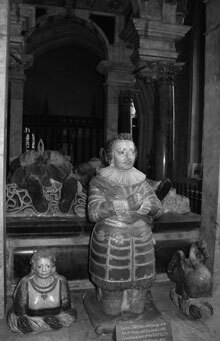 In this episode Mike and Will head up the road to Burford to take a peek inside Speaker Lenthall’s Tomb by M.R. James! Yes, it is another unpublished M.R. James manuscript fragment this week. The most complete version of this story is available in ‘Curious Warning: The Great Stories of M.R. James’ edited by Stephen Jones. This story is set against the backdrop of the work of the Oxford Movement, also known as the ‘Tractarians’, who agitated for religious change within the Church of England in the first half of the 19th century. M.R. James once again uses this story to take a swipe at the followers of the gothic architectural revival, whose renovations of English churches during the 19th century resulted in the destruction of many historic church interiors. The church that features in this story is St John the Baptist Church in Burford, West Oxfordshire. Check out the 360-degree view from the church tower, which gives a very nice view of the town as it looks today. The tomb in this story is based on that of an ancestor of Speaker William Lenthall, Sir Lawrence Tanfield. Like the tomb in the story, it fills up most of the north choir aisle of Burford Church, and largely matches the stories description. In the story Mr Cave and his family live in what was originally Burford Priory, now a very fancy private residence. Also see this pdf for images of the Priory as it was at the time of this story. Those in the UK can also watch this episode of ‘Time Team’ on 4oD in which they excavate the remains of the priory hospital beneith the front lawn! And finally, how do you link Speaker Lenthall to the phone hacking scandal? Easy! To see photos taken by Will of Burford Church, the Tanfield/Lenthall tomb and of Burford Priory, head over to our Facebook page. Very much like The Ash Tree was this story. Personally, I would have preferred the worm, because James does use his spiders and hair a lot. Gotta admire a guy who puts such a vague and downright metal inscription for his gravestone as ‘I Am Worm’. Also, I think the story Will was talking about was ‘Caterpillars’ by E.F. Benson, but I cant be sure. I agree that the wallop here is awfully similar to quite a few others we’ve come across. I think it’s a big divide in horror stories: do they happen to people who had no idea what they were getting into, or do people have already to know something or to poke into things they shouldn’t before the horror is sprung? Most authors seem to stick to one or the other. As a horror writer (absolute amateur), I can say that it seems to work better, in a way, from the whole fear of the unknown standpoint, to not have your main character know what is going on, from the whole fear of the unknown standpoint. But that by no means means that the main character can’t have in inkling of what is going on, but it should be something just out of the ordinary, but in an obvious way that draws you attention to it, and perhaps your main character can make the connection that something they did caused it. I myself prefer the former vastly, to be honest. Enjoyed this one a lot – especially since I have a copy of A Pleasing Terror (thanks to you folk), and glad to hear more of that story fragment. Meanwhile you have me really interested in that tomb and the lady with the immodest dressline. This link (http://www.geograph.org.uk/photo/2702620) calls her a demi-maiden – which is apparently something in heraldry? I was wondering if it had something more to do with court fashion and was hoping for some salacious stories. Ah well. There have been plenty of periods from the 1100s on in which it was fashionable for ladies to wear dresses that exposed much or all of their breasts. Sometimes the breasts were bare, and sometimes covered with thin, sheer material. It’s only since Queen Victoria (who was not averse to what is by modern standards a low neckline) ascended the throne that the bared breast has become entirely unfashionable. I knew that one day this “useless” piece of info would come in handy! EF Benson wrote a story called “Caterpillars” which featured scenes of a bed crawling with caterpillars (or, to be specific, hairy caterpillars with crab-claws). Is this the story you were thinking of when you mentioned one that featured a bed crawling with worms? A couple of questions. What could have been in the missing page(s) which didn’t duplicate what follows? Also, why would anyone build a funerary monument topped with the figure of Envy? You’d expect something a bit more edifying than that, surely? I’ve known a couple of very strong-willed and relatively healthy elderly women simply will themselves to death after having to go into residential care because of falls or after bereavement. As to rushing to his friends with the ink still wet, it might be that he worked on various drafts and then wrote up the finished thing in his nicest hand on the day. I think your second point is spot-on. We know that many of MRJ’s drafts are in pencil. Perhaps he copied the stories in ink so that he’d be able to read them out by the light of a single candle.